Accommodations in Deluxe A/C Double room for 3 nights and 4 days. Complimentary Breakfast only (Food Plan on CP Basis) on each day of stay. Breakfast at hotel followed by visit to Lingaraj and Mukteswar Temple. Drive to the famous Buddhist Stupa on Dhauli Hills, Jain caves at Khandagiri. Shoppings or amusement at evening. Breakfast at hotel. Take an hour drive to the Konark Temple and Chandrabhaga beach. Take the Marine Drive to Puri and visit the Jagannath Temple. Evening at the Puri Beach. Pipli- Shopping on the way back to Bhubaneswar. Breakfast at hotel proceed to Chilika. This is the largest freshwater inland lake in Asia. It is also called as the "honeymooners' paradise". During winter season, a large number of migratory birds arrive here. Breakfast at hotel. Drop at the airport of railway station. Transportation in an A/C chauffer driven Indica or similar car for all sight-seeing tours. One day tour to Temples and Historical monuments of Bhubaneswar. One day tour to Konark - Puri - Pipili. One day tour to Chilika lake, bird Sanctuary, Kalijai Island. Drop-off from the railway station/airport. The check-out on 4th day would be same as the check-in time. One of the premium budget class hotels in Bhubaneswar, Pushpak offers great location, great rooms and great services at an affordable price. Pushpak gives you the option to choose from a variety of rooms. 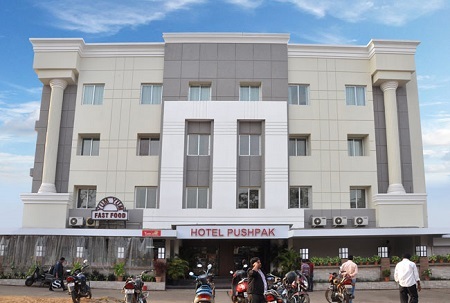 Located in the center of the city, less 1 Kms from Railway Station and 3 Km from Airport, Pushpak is one of the most centrally located hotels in Bhubaneswar. Impeccable guest service, 24 hour front desk and personalized service makes our guests visit us again and again. Our rooms are tasteful and spacious. And we offer a wide range of rooms to choose from to suite your budget. You will never find such rooms at our cost. Distance from railway station: 1 km. Lingaraj and Mukteswar Temple: 2 km. Entry fee to any monuments where applicable.